I've been intrigued by Frida Kahlo since the time I heard of her a few years ago. The first I heard of her was when I came across a quote of hers where she says, "I am my own muse. I am the subject I know best. The subject I want to better." I started digging up more information on her since then. Every piece of news about her was fascinating and soon she became an inspiration. Frida Kahlo was a Mexican artist who painted many portraits, self-portraits and works inspired by the nature and artifacts of Mexico. She employed a naive folk art style to explore questions of identity, post colonialism, gender, class and race in Mexican society. Her paintings often had strong autobiographical elements and mixed realism with fantasy. Because of this she has been described as a surrealist or magical realist. You can just Google her name and you will be able to see most of her paintings and quotes. She's a gorgeous woman and totally rocks the uni brow, but what is more inspiring is the fact that she's a survivor. She fought against all odds and various illness to follow her artistic passions. Frida was disabled by polio when she was six, making her right leg shorter and thinner than the left. This resulted in years of mocking and bullying by her peers. Yet, she worked hard and wanted to get into medical school. When she was eighteen, she met with an accident that fractured her ribs, pelvic bone, both her legs and her collarbone. The accident had also displaced three vertebrae rendering her with life-long back pain. The accident ended her dreams of becoming a doctor and caused her pain and illness for the rest of her life. That is when she found solace in art. She had a specially-made easel that enabled her to paint in bed, and a mirror placed above it so she could see herself. Most of her paintings were portraits of herself, her sisters, and school friends. Despite her illness, she experimented with different techniques and her paintings began to show a stronger narrative style. She also began placing emphasis on the themes of terror, suffering, wounds, and pain. Soon, her paintings were gaining recognition and she was becoming a known face. But her illness, enhanced by a failed pregnancy, tried taking her down. She fought her illness all her life and never gave up. Even a failed marriage did not make her give up on hope. When her sickness elevated and she had to miss an exhibition of hers, to the surprise of the guests, she arrived in an ambulance and was carried on a stretcher to the bed, where she stayed for the duration of the party. Frida did not come from a very good family. She often described her childhood as "very, very sad". In the search for a father figure in her life, she met, fell in love and married a man 20 years her senior. When her husband began an affair with her own sister, she surprisingly forgave them and even became a loving aunt to their children. She soon divorced her husband, but managed to remain friendly with him till the end of her life. Here was a woman who had been cheated by life at every step. Yet, she did not give up. She fought her family, she fought her ailing health, she tried everything that she could, just to survive. Her undying spirit is inspirational. Her uncompromising depiction of the female experience and form in her paintings is brave and inspirational. There is something about this woman that is equally mysterious and inspiring. 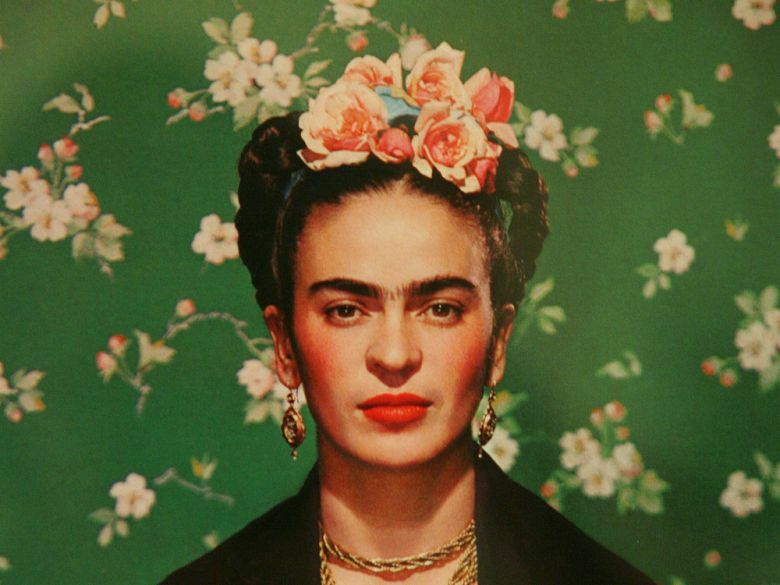 Today you have acquainted me with Frida's personal tragedies and setbacks. But she was a fighter and an enigmatic person. I knew her through her paintings.Thanks for sharing this post. Oh yes! She was quite something. 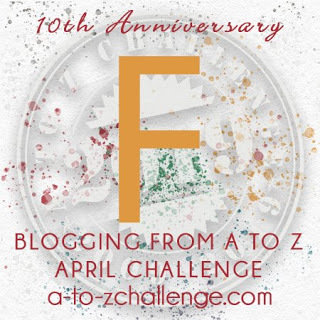 I believed you'd write about Frida for the letter F. And I'm glad you did! Beautiful writeup! Do read up about her. Her story is fascinating. I've heard of Frida Kahlo, but sure didn't know all of this about her. Her story is incredible. Thank you for sharing. You are welcome, Laura. Do read up about her, she's quite something. Her paintings are intriguing! She is a very good example of having a never say die spirit! I love this series Soumya! Oh yes! Thank you, Reema.